WAS ESTABLISHED ON PENTECOST, 33 A. D.
Along with redemption in Christ, the kingdom is the foremost theme in the Bible. These two are so interrelated that to misunderstand them is to misunderstand much of the Bible. Many fanciful theories on the kingdom of God have been worked out by men which only obscure the real nature of the kingdom. One of the more prominent theories affirms that the kingdom has not been established, but will be set up when Christ returns. At that time, they say, Christ will rule on a literal throne in Jerusalem for one thousand years. Furthermore, this view states that the kingdom and the church are not the same institution; that the church was something added as an afterthought because the kingdom was reflected when Christ tried to establish it during his first advent. This theory is commonly known as premillennialism. The kingdom and the church are the same institution. The two words express different aspects of that institution just as the words "body" (Ephesians 1:22-23) and "house" (1 Timothy 3:15) express different aspects of the church. The following considerations show that the kingdom and the church are the same. (1) Jesus used the words interchangeably. In Matthew 16:18 he said, "I will build my church." In the same breath he said, "I will give unto thee the keys of the kingdom" (Matt. 16:19). If the two are not the same, Christ built one thing, but gave Peter the keys to another thing. If the kingdom has not been established, Peter and the other apostles have never used the keys, and one may wonder why they were given to them? (2) The Lord's supper was to be in the kingdom. When Christ instituted the Lord's supper he said, "I appoint unto you a kingdom as my Father hath appointed unto me; that ye may eat and drink at my table in my kingdom" (Luke 22:29-30). However, the Lord's supper was observed in the church in Corinth (1 Corinthians 11:17-30), and in the church in Troas (Acts 20:7). Since the Lord's supper which was to be in the kingdom was observed in the church, the kingdom and the church must be the same. (3) The seed produces subjects of the kingdom and members of the church. In the parable of the sower, Jesus called the word of God the "word of the kingdom" (Matt. 13:19). In Luke 8:11 the word of God is called the "seed". When the seed or the word of the kingdom was received into honest hearts it produced subjects of the kingdom. However, when the same seed was received by the Corinthians it produced members of the church. "Many of the Corinthians hearing believed and were baptized" (Acts 18:8). Later, when Paul wrote to these Christians he called them the "church of God which is at Corinth" (1 Cor. 1:2). God decreed that seed is to bring forth after its kind (Genesis 1:11). Since the word of God, the seed, produces subjects of the kingdom and members of the church, and since seed will produce the same product, it follows that to be a member of the church is to be a subject of the kingdom. (4) After Pentecost of 33 A.D., both the kingdom and the church are spoken of as a present reality. Acts 2 is the pivotal point of Bible history. Recorded in this chapter are the events of the first Pentecost following the resurrection of Christ. Prior to this chapter the kingdom and the church are spoken of as future. Earlier Christ said, "I will build my church" (Matt. 16:18). In the last verse of Acts 2 we learn that "the Lord added to the church daily such as should be saved" (verse 47). In like manner, the kingdom was not a reality before Acts 2; it existed only in promise and prophecy. John preached, "the kingdom is at hand" (Matt. 3:1-2). Jesus preached, "The time is fulfilled, and the kingdom of God is at hand" (Mark 1:15). Furthermore, he said, "There be some of them that stand here, which shall not taste of death, till they have seen the kingdom of God come with power" (Mark 9:1). After Acts 2 the kingdom is said to be in existence. Members of the church at Colossae were in the kingdom. Paul said, "Who hath delivered us from the power of darkness, and hath translated us into the kingdom of his dear Son" (Col 1:13). John said that he was in the kingdom (Revelation 1:9). The above evidence clearly demonstrates that the church and the kingdom are the same. If one has been in existence since 33 A.D., the other has been in existence since then. As previously stated, premillennialism teaches that the kingdom was offered to the Jews at his first advent but it was rejected. Therefore, the offer was withdrawn and the kingdom is held in abeyance until his second advent. At that time he will begin reigning on a literal throne in Jerusalem. That the above is false and that Christ is now reigning as King of Kings may be seen from the following considerations. (1) Christ cannot reign on earth. An Old Testament prophecy states that no seed (descendant) of Coniah (Jeconiah) "shall prosper, sitting upon the throne of David, and ruling anymore in Judah" (Jeremiah 22:30). The genealogy of Christ in Matthew, chapter 1 lists Christ as a descendant of Jeconiah (Matt. 1:12). Since Christ is the seed of Coniah and since no seed of his can reign on David's throne on earth, it follows that Christ cannot reign on David's throne on earth. This does not forbid Christ from reigning on David's throne; it only forbids him from reigning on David's throne on earth. In Luke 1:32-33 we learn that "the Lord God shall give unto him the throne of his father David. . ." Christ now reigns from heaven. (2) Christ began reigning after his ascension. On Pentecost in 33 A.D. Peter affirms that the prophecy of David concerning one who would sit on his throne was fulfilled in Christ's resurrection. "Being therefore a prophet, and knowing that God had sworn with an oath to him, that of the fruit of his loins, according to the flesh, he would raise up Christ to sit on his throne; he seeing this before spoke of the resurrection of Christ. . ." (Acts 20:30-31). (3) Christ will cease to reign when the end comes. Contrary to premillennialism, which affirms that Christ will begin to reign when he returns, the Bible teaches that he will cease to reign when he returns. "Then cometh the end, when he shall have delivered up the kingdom to God, even the Father; when he shall have put down all rule and all authority and power. For he must reign, till he hath put all things under his feet. The last enemy that shall be destroyed is death" (1 Cor. 15:24-26). The kingdom of God is almost 2,000 years old. As king, Christ rules its subjects. 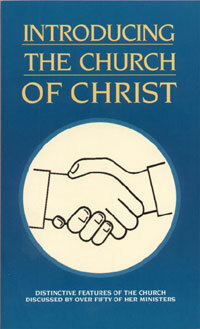 The church of Christ is 2,000 years old; as head, Christ directs its members. Thanks be to God the kingdom shall stand forever (Daniel 2:44) and "the gates of Hades" will not prevail against the church (Matt. 16:18). Describe the doctrine of premillennialism. Discuss the idea that Acts 2 is the pivotal point of the Bible. In addition to the word, "church", what other terms describe the kingdom? Give the date, geographical location and the Bible chapter which tells of the beginning of the church. Name two things that will take place when "the end comes."